This month’s publication of a colourfully illustrated, revised edition of Michael Pollan’s 2009 bestseller, Food Rules: An Eater’s Manual, once again has me thinking about the role of historians in contemporary debates about the health and environmental impacts of our current industrial food system. As a historian of food and nutrition, I often find myself getting a bit squeamish whenever I hear anyone invoking the past to either defend or critique contemporary dietary practices. And Pollan, like other critics of the food industry, makes extensive use of history to guide his analysis of our current food choices. My first reaction when I read Pollan’s second rule ­– “Don’t eat anything that your great-grandmother wouldn’t recognize as food” ­– was therefore immediately defensive. In part, this was based on my own reading of the often strange and wonderful recipes from the dozens of early- and mid-twentieth century cookbooks that were part of the research for my dissertation on the politics and culture of food and nutrition in Canada during the Second World War. Kate Aitken’s 1945 recipe for Green salad from her Canadian Cook Book (Vancouver: Whitecap Books, 2004), 224. 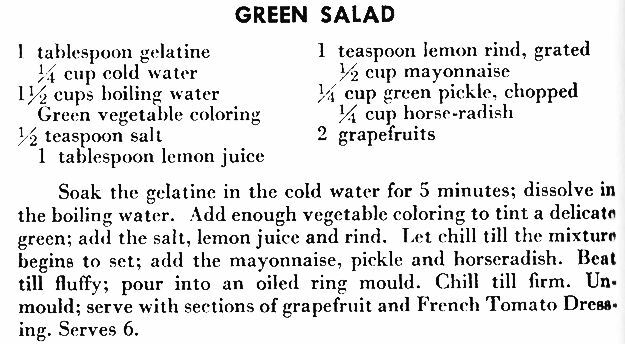 “Green Salad,” of course, is just the tip of the culinary iceberg. I could list dozens of other recipes that my great-grandmother might have read in cookbooks and magazines from the 1920s, 1930s and 1940s that would seem alien to most of us in the early 2010s. I’m personally still not brave enough to try Mrs. Elmer Scott of Newington Ontario’s recipe for “Pork Fruit Cake” – which includes 1 lb of “salted fat pork, chopped fine” – from the 1941 Cornwall Standard Freeholder Cookbook. In Pollan’s defense, he readily concedes that the rule doesn’t always work perfectly and he stresses that it’s main purpose is that avoid eating many of the industrial preservatives, flavour enhancers, stabilizers, and other food additives that have become the basis our modern food system since the 1940s. Pollan even adds an addendum that you could substitute your own great-grandmother if she was a “terrible cook or eater” for someone else’s great-grandmother – particularly if that person is Sicilian or French. 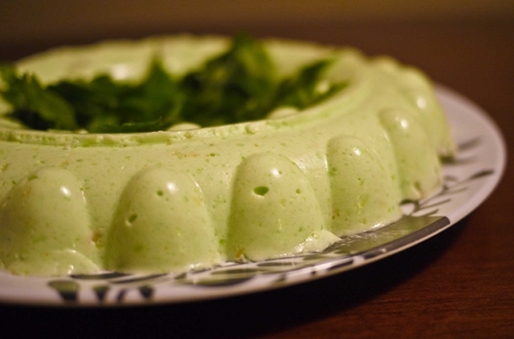 While it’s easy to quibble with the details of Pollan’s great-grandmother rule – pointing out, for instance, that something like Jell-O, one of the quintessentially modern, mass-produced convenience foods, was introduced in 1897 ­­– the rule itself nonetheless acts as a useful shorthand for Pollan’s broader point. Our grandmothers and great-grandmothers, by and large, ate far less processed and heavily refined industrial foods than most of us currently do. The great-grandmother rule therefore provides a good place to start thinking about how our diets have changed over time. And, despite its faults, it’s probably much easier to wrap your head around than the confusing “servings” that form the basis of the contemporary Canada’s Food Guide or the recently abandoned USDA Food Pyramid. Pollan, of course, is not alone in pointing to the past for solutions to our contemporary problems. Whether it’s the current movements promoting the 100- mile diet, slow food, or the legalization of raw milk sales, food reformers often invoke the past as both a model and justification for changing contemporary practices. The same is also often true of the proponents of genetically modified foods, who point to the post-World War II green revolution and the history of famines and food shortages in the developing world to justify current drives to increase yields through the patenting of novel plants and animals. Even fad diets like the popular “paleo diet” often claim a certain level of legitimacy for their recommendations by invoking the supposed foodways of our ancestors. In many ways, Pollan’s great-grandmother food rule and all of these broader attempts to use our knowledge of the past to deal with some of the most pressing contemporary issues is an extremely hopeful sign – despite the cringe inducing use of history by some, such as the “paleo diet” promoters. The general public and policy makers alike are, perhaps more than ever, looking to the past to explain our present predicament and to come up with viable solutions. This means that, not only can historians provide some important nuance and detail to these contemporary debates, but they can also help to encourage Canadians to engage more broadly with their past. Ultimately, my own hope is that these kinds of calls to examine the diet of our grandmothers and great-grandmothers is accompanied by a growing interest, not just in how they ate, but in the role that food played in defining their lives and work, more broadly. While it is often easier to draw a direct line between the work of environmental and economic historians and problems with our contemporary food system, these kinds of invocations of our shared social and culinary history offer new outlets for other groups of historians to similarly engage with the general public. In Canada, academic social and cultural historians, in particular, have been slow to meet this growing interest in food and culinary history. But the recent publication of an edited collection on Canadian food history from McGill-Queen’s University Press and a forthcoming collection from the University of Toronto Press – combined with a growing interest at a number of libraries and archives in cookbooks and other forms of culinary literature – are encouraging signs. Hopefully, by adding our voices to these contemporary debates over the future of food in Canada, professional social and cultural historians can find new audiences for our work and a more active (and activist) role in our communities.